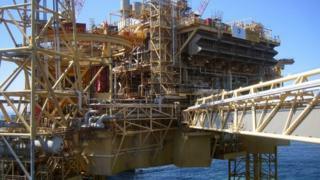 The UK's oil industry is in "crisis" as prices drop, a senior industry leader has told the BBC. "This has happened before, and the industry adapts, but the adaptation is one of slashing people, slashing projects and reducing costs wherever possible, and that's painful for our staff, painful for companies and painful for the country. "It's close to collapse. In terms of new investments - there will be none, everyone is retreating, people are being laid off at most companies this week and in the coming weeks. Budgets for 2015 are being cut by everyone." Mr Allan said many of the job cuts across the industry would not have been publicly announced. Oil workers are often employed as contractors, which are easier for employers to cut. His remarks echo comments made by the veteran oil man and government adviser Sir Ian Wood, who last week predicted a wave of job losses in the North Sea over the next 18 months. This month it announced a 20% reduction in its worldwide capital expenditure budget, in response to falling oil prices. Other big oil firms are expected to make similar cuts to their drilling and exploration budgets. Research from the investment bank Goldman Sachs predicted that they would need to cut capital expenditure by 30% to restore their profitability at current prices. Service providers to the industry have also been hit. Texas-based oilfield services company Schlumberger cut back its UK-based fleet of geological survey ships in December, taking an $800m loss and cutting an unspecified number of jobs. On Wednesday Aberdeen-based Wood Group announced a pay freeze for staff, and cut rates for its contractors. Apache, one of the North Sea's biggest producers, has followed suit and will impose a 10 percent reduction on its contractors' wages from January 1st. The industry trade body, Oil and Gas UK, said: "While Oil & Gas UK cannot comment on the commercial decisions, and individual opinions, of its members, the industry trade body recognises that the falling oil price is affecting activity across the UK Continental Shelf and companies are having to take hard decisions in light of this challenging business environment." UK oil and gas production has been in decline since 1999 - though the rate of decline slowed in 2013, a year which saw the highest level of investment on record. The industry was hoping to see continued high levels of investment, stemming the inevitable decline of production as North Sea's resources are used up. But falling oil prices have put that in doubt. However, the Department of Energy and Climate Change said: "The recent sharp reductions in oil prices are very challenging for companies active in the North Sea. We have seen very little evidence of new projects being cancelled or deferred in reaction to lower oil prices." To avoid the oil investment boom turning into a bust by the dramatic fall in the price of Brent crude, firms in the industry are having to go for unusual measures. While lower energy costs help drivers and most of the UK economy, it is a concern for north-east Scotland and beyond that investment plans are being shelved. Goldman Sachs has suggested $930bn of projects, worldwide, could fail to get the go-ahead next year. And the North Sea is seen as one of the higher-cost, lower-return regions for investment. In mature fields, there is the prospect of closure being brought forward. And as a lot of production ceases to make money below $80 barrel (it's now in the region of $63), North Sea producers and those in their supply chain now face pressure to cut costs sharply. Those costs have been rising steeply in recent years. And measured per barrel of production, they've been rising at an alarming rate. The oil price fall has only intensified the pressure to get them under control. The oil industry is more used than most to having to flex in this way. When the oil price is high and investment strong, the cost of assets such as drilling rigs goes up sharply. And this is also an industry which relies heavily on individual contractor work, giving it flexibility on contracts and on pay, and often works best for those workers too.